I discovered yoga after sustaining overuse injuries from playing soccer. Although I originally thought it would be a great option to encouraging me to work on flexibility; My first class expanded my understanding and proved to be an excellent and beautiful blend of strength, stretch, aerobic, mental and spiritual work and I was immediately hooked. I received my 200hrs in Costa Rica thru Peak Beings Yoga. I have had the opportunity to follow and learn from Dr. Ray Long, Shiva Rea, Beth Shaw, Unnata Aerial Training, Paul Grilley among others. Because of my own bodies journey I love to teach to a strong awareness of the physical, neurological and physiological interactions in the body that occur with the combination of breathing, awareness and movement; My goal in every class is to draw a picture of present moment sensation and awareness, as well as, be on a journey with my fellow yogi and yogini’s in the class, as they find their personal expression of the poses and vinyasas. Sean began his new yoga path by becoming certified with Karma Kids Yoga in 2008. He has since completed several more Karma Kids to stay up to date on the fun and creative world of Kids Yoga. He received his 200-hr certification from Flow Yoga Center in Washington, DC in 2011. Thru the years he has created classes and workshops for all bodies and all abilities. Sean is also certified to teach Mindful Yoga Therapy, a yoga and breathing series which helps Veterans and others with PTSD find a calm, steady body/mind and to continue productive peaceful lives via mindful yoga practices. Hi, I'm Melanie! I have been a pole instructor for little over a year now. I teach Beginner Pole and Intermediate Pole each week. I love Pole Fitness because it is a whole body workout, it increases flexibility, gives you confidence and an appreciate for your body and I love the pole community we have created at our studio. I am a proud mother of twins and an elementary school teacher by profession. I grew up in Charles County and currently live in La Plata. By day I am a Natural Resources technician for the Maryland Department of Natural Resources Wildlife and Heritage Service. I also own a small soap business called Southern Maryland Soap Company! I grew up in La Plata, went to The University of Tampa and earned my bachelors of science in Marine Science - Biology, and a minor in Environmental Science. I love to hunt and fish and just get outdoors. I love to cook delicious real food so if you have recipes to share, send them my way! I am someone who loves to be active and in shape, but I have always struggled to keep consistent with my workouts... that is until I found pole! Pole fitness has been a life changer for me, challenging me is so many different ways. There is nothing more rewarding then seeing someones face light up when their body surprises them with what it can do! I love sharing my passion for pole fitness and I cannot wait to meet you! College Graduate from Notre Dame of Maryland University with a degree Special Education. She has been practicing yoga for 5 years, and has been developing and growing the Dharma Kids program since it started. She played for the CSM womens soccer team and loves sports! She enjoys children and all they have to offer, she loves to see their light shine and helping to make the world a brighter place by spreading Peace-Harmony-Laughter & Love! Janine DeLauder is a 200 hour RYT with yoga alliance, Children's yoga teacher, and elementary school teacher. Janine took her first yoga class in 2008 when she began teaching in Elementary School and fell in love with the physical and emotional aspects of the practice. She believes that yoga is for everyone and hopes that her yoga class brings peace, strength, and happiness to every person that joins her. Karen’s passion for movement began at age 4 as a dancer in her hometown in Waldorf, and she started practicing yoga about 17 years ago. Although a renaissance woman, she has a master’s in business with an emphasis in marketing and website development. She enjoys gardening, cooking, nature, and outdoor activities, with beliefs in a holistic approach to wellness. She received her 200-hour YA certification in October 2016, with a faith-based group called YogaFaith in Washington State. She has been teaching since November 2016 and enjoys using the practice to tap into improving other areas such as spiritual growth and mental health. Her mission is to bring this extension to community members struggling or suffering with life's challenges. As an advocate for yoga being accessible to everyone, she believes in listening to your body in the here and now, and to always honor that in movement and stillness. Her motto is "We should always be learning, living and loving". More than 18 year practitioner of mind-body arts - Stefan is a Registered Yoga Teacher (RYT200) with Yoga Alliance. 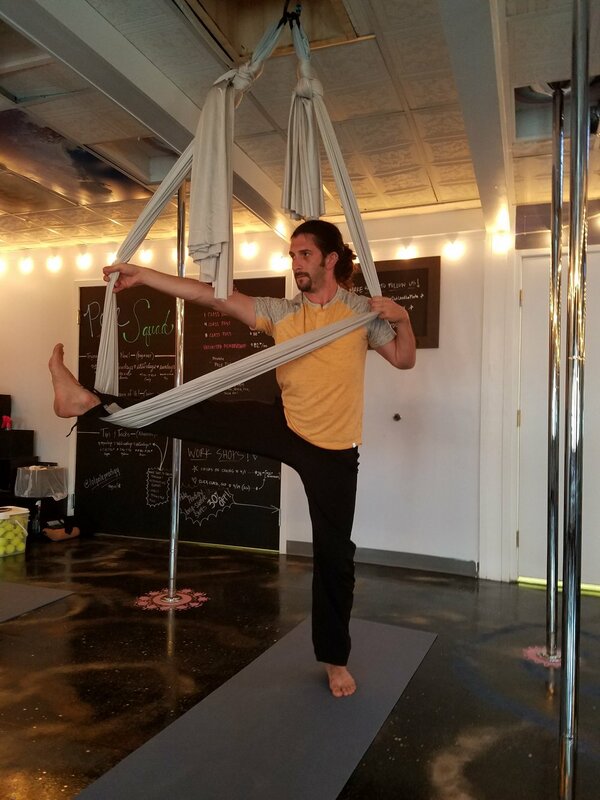 Teaching in the Northern Virginia and Washington D.C. area - Stefan strives to create classes in an atmosphere that is welcoming, non-judgmental, but allows us to challenge and explore ones edge regardless of experience. Stefan embraces awareness and connection to the environment - that which we occupy on the mat, recognition of the interconnection of all living systems, and our individual role in stewardship. Stefan is also ranked as Sandan (third degree black belt) in Aikido and Shodan (1st degree black belt) in Iaido, a Japanese sword art, and is a teaching member of Aikido of Northern Virtginia and George Mason University martial arts program. She has been working with children for over 30 years. She received her BA in Psychology with a Minor in Child Development from East Carolina University. Growing up she had positive experiences as competitive dancer, cheerleader and gymnast and loves to spread the positive attitude to the kids. She is a proud mother of three; loves being outside with her husband and working with children to help them find their unique gifts and share them with the world! Tere Erdmann Hubler has been a student of movement for over 35 years. Her knowledge in Ballet stems from her early study of Cecchetti Ballet with Les Cher Ballet Academy and includes studies at the North Carolina School of the Arts. She danced semi-professionally with Ballet Theater of Maryland under the direction of Edward Stewart (1980's), as well as Southern Maryland Modern Dance Collective (2004-2005). Tere graduated from University of Maryland with a Bachelor of Science in Education in 1989. In addition to her Ballet training, she began teaching Pilates in 2004 and is certified in Peak PilateSystem-Professional Comprehensive. This is the highest possible Peak PilateSystem certification requiring a minimum of 476 hour program with successful assessment on the Mat, Reformer, Tower, Chairs, Barrels and auxiliary equipment. Tere began studying The MELT Method in May 2017. The MELT Method® (MELT®) is a simple self-treatment designed to help you stay healthy, youthful, and active for a lifetime. This full-body method of self-care can be customized to your particular needs – from improving performance and decreasing the risk of repetitive stress injuries to eliminating chronic pain, regardless of what’s causing your pain in the first place. Judi recently retired from 20+ years of coaching competitive gymnastics, and was a gymnast herself, making body awareness and movement some of her most influential life experiences. “The transition into the yoga life was a homecoming.” Judi began practicing yoga many years ago to find relief from pain. She enjoys the increased strength, functionality, and feelings of wholeness and youthful mobility gained from a dedicated yoga practice, and wants to share the joy of how yoga can help prevent and alleviate pain. Judi loves the therapeutic focus of breath and alignment, modalities that improve cognitive function, and the healing of mind, body and spirit through movement. Currently teaching private sessions, classes with a therapeutics focus, and workshops for improved cognitive function and relieving pain with therapeutic props & movements. RYT 200 Evolve Yoga+ Wellness, California, Md., Interdisciplinary Yoga Teacher Training, Nosara Yoga Institute affiliate. June 2013, 100 hrs Yoga Therapy Body Balance Yoga, Annapolis, Md. 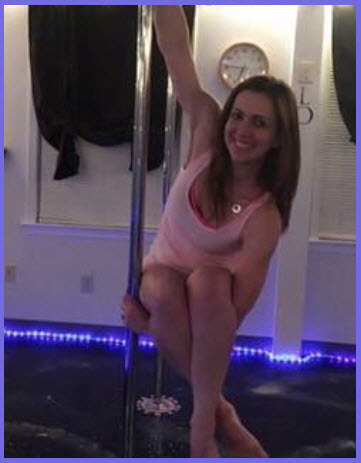 June 2018, 500 hr RYT with a Therapeutics Focus, Glenmore Yoga & Wellness, Richmond, Va.
I’m Sara and I am an instructor at Pole Prodigy. I am a Southern Maryland native. I used to compete in horse shows, and I have experience in dance. I have been associated with Live Out Loud for a few years. I originally started coming to the studio as a yoga student. While being a student, I discovered pole. I became obsessed with pole and was taking every class I could get my hands on. Pole fitness is not a skill that came naturally for my body. As I took more pole classes, I started to notice changes in my body both physically and mentally. I steadily started to become stronger and stronger, and I noticed my muscles becoming more defined the more I trained. I have become good friends with both instructors and students at the pole studio. I officially became an instructor at Pole Prodigy in September of 2016. I currently have a regular weekly class, and I also do a monthly Pole Flow and Dance class. I am also a huge animal lover. I follow a strict vegan diet, because of my love for animals. I am the proud owner of two adorable Miniature Dachshunds (Forrest and Bubba) :) My full time profession is in the Early Childhood Education field. I am a true believer that pole fitness is a skill building process, and no matter what level a poler is at; there is always something to improve and work on. I enjoy all of the relationships I have made at the studio, and I can't wait to continue to grow as an instructor and meet more people as the studio grows. I have been interested in the healing arts since I was young and wanted to be a healer/medicine woman. I went to nursing school and used to dream of transforming hospitals into actual healing sanctuaries. Although I became a Registered Nurse in 1987, I was much more interested in the use of herbs and home remedies for healing what ails us. I have studied many different modalities including energetic healing, Therapeutic Touch, Shiatsu, Swedish massage. I also have been practicing and sometimes teaching Aikido, a healing martial art, since 1996. >>> Since moving to England in 2008 I have let my nursing license go and have focused more on caring for my mother, doing in-home care for elderly and disabled folks, and my own healing. Now in my 50’s I am wanting to integrate my life’s experiences with what I’ve learned to create a more calm and centered way of being. My goal is a flexible, pain free body and a calm as well as creative mind. TRE is a modality that allows me to feel what is happening in my body, to be present with that in a loving, compassionate, non judgmental way so that tension and stored trauma can be gently released. I have found it has been a great support to me in the past 2 years and I look forward to sharing it with you! Dawn Powell is a 500hr-RYT and native to southern Maryland. She teaches and trains out of Evolve Yoga Wellness (RYS) in California, Md. a partner with Nosara Yoga Institute based out of Costa Rica. Also featured at Live Out Loud Yoga in Laplata, serving corporate clients like SMECO and Board of Education as well as private clients. Bringing yoga to every BODY has always been an intention for her classes since training in Self Awakening Yoga, Adaptive Yoga, Therapeutics and the practice of Pranassage. In her classes she leaves space for what needs to happen, space for fun, and space to connect with the present and what is, so that we may practice the same off the mat. Dawn also teaches Holy Yoga classes, allowing space for us to connect with Christ, mind, heart, body and soul. Whatever condition or season of life we may be in, all are accepted, all are welcome. I’m Chelsey. Pole fitness had always intrigued me, but I never had the courage to attend a class without trying to convince someone to join me… until about two years ago when I got up the courage to finally attend a class (and yes, I was riding SOLO on this one). I took my first class, then my second, third, fourth and to this day, I have lost count of the classes that I have attended- I fell in love. For the first time in my life, I fell in love with my workout and developed a passion. About a year ago, I joined the Live Out Loud family as a teacher and it has probably been one of the most rewarding jobs I have had. I live for the moments where I am able to show my students their potential and what their bodies are capable of- turning those “I can’t” into “I can!”. I look forward to meeting you! Wanda’s personal yoga journey began as a means to find relief from Fibromyalgia and its accompanying symptoms of chronic pain and fatigue. However, through yoga, she discovered life balance and peace, something that was absent during her more than 20-year military career. Now as a yoga teacher, Wanda is able to share the elements of movement plus the benefits of being still and purely present in the moment. She inspires others to find their inner peace. Because she believes everyone is created uniquely, she encourages individuals to value themselves and practice with awareness of their uniqueness, blending the spiritual and physical aspects of the discipline, while emphasizing focus on the breath to peacefully engage with yoga and meditation. Yoga Instructor and Reiki Master, received her 200 hour training in 2001 after practicing yoga for a decade. Since then she has been teaching students of all ages. Karen is an open, warm and welcoming person who is devoted to the life-long study of yoga and it is her greatest pleasure to share her love of yoga with her students. Karen teaches Vinyasa, Yin, Restorative, Energy Medicine Yoga, and Meditation. Started practicing yoga because she knew she needed to move her body and she disliked going to the gym. Surprisingly, yoga helped her feel centered and joyful and even a vigorous, hot class left her feeling energized and eager to return. Yoga has now been a part of her life for about 10 years and she has grown to appreciate the simple beauty of breathing and moving in and out of postures and being curious about the limits and depth she finds in her body and mind each day. She credits yoga for having greater inner and body awareness allowing her to feel more mindful and connected to other people, something she believes her family, clients in her mental health practice and students in her University classroom benefit from. Seeing the benefits of yoga personally, Kendra became a Registered Yoga Teacher in 2012. Because of her clinical social work interest in trauma, she’s also had additional training in trauma-sensitive yoga, appropriate for all students and all levels. 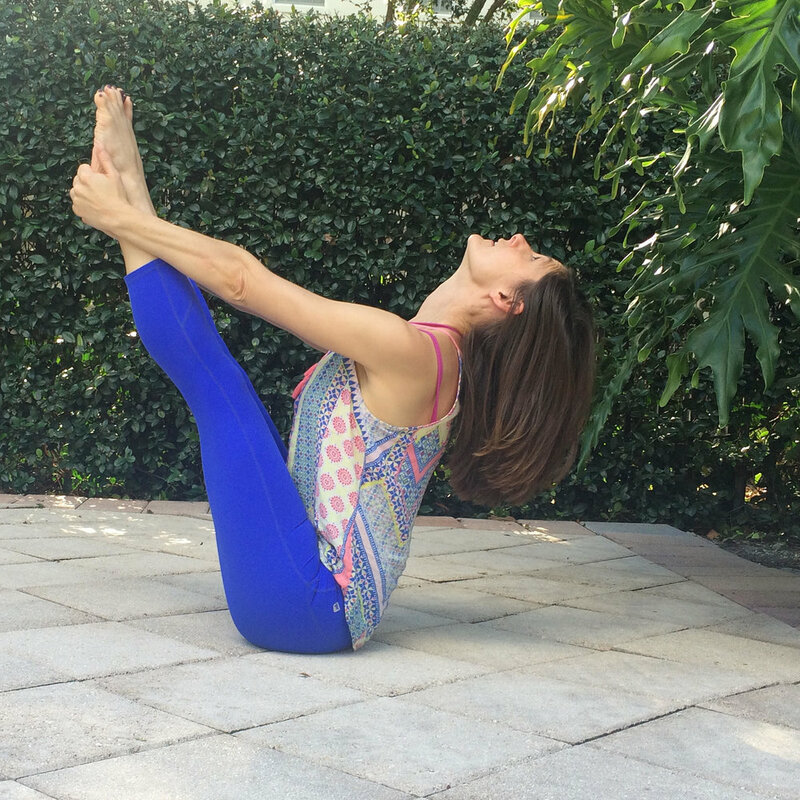 Kendra teaches gentle and vigorous vinyasa style yoga and has a particular interest in yoga for women and girls, seniors, and for emotional well-being. Her hope for every student in her yoga classes is that one leaves feeling joyful and peaceful, having been challenged yet hopeful, and feeling encouraged to continue practicing yoga. Sandy Sisk began her yoga journey in 2011 to help deal with stress at work. After seeing the benefits of yoga -- not only physically but also mentally -- she knew she had to pursue it further. Beginning her training at Flow Yoga Center in DC, Sandy discovered just how deep yoga could go and embraced it with all her being. She embodies the thinking of "just your body and your breath on this mat" in her teaching and encourages her students to do so as well. Stressing non-judgement of yourself and those around you, Sandy's classes are open, with lots of modifications and leveling up options. Classes tend to be more vigorous and challenging, but Sandy sees that as a way to challenge your own inner monologue, pushing yourself to do more than you thought you could do. Sandy loves sharing her joy of yoga with others and is energized by the curiosity of her students. Sojourner Williams is a native of New York where she received her 200 hr certification to teach Vinyasa yoga at Laughing Lotus Yoga- NYC in 2008. A former teacher and Reiki Master, Sojourner has called the DC metro area home for the last two years. An E-RYT 200, Sojourner teaches Vinyasa, Restorative and Kids yoga. I received my 200 hour certification from the Columbia Yoga Center, Columbia, MD. My approach to teaching is “user friendly and hands on” which allows for both, the very beginner and the more advanced student, to be challenged. My classes flow with attention on full deep breathing, creating the connection of breath to movement, while still emphasizing proper alignment.